An important chapter in the career of one of Hollywood’s brightest young stars comes to a close as Jennifer Lawrence picks up the bow and arrows for the last time in The Hunger Games: Mockingjay – Part 2, the final adaptation from Suzanne Collins wildly popular young adult series. Mockingjay – Part I picks up where Catching Fire left off, with Katniss having been rescued from the arena by a band of rebels who have been hiding away in District 13. Katniss’ act of defiance which ended the Quarter Quell has inspired the people of Panem’s districts, and the rebels are now attempting to harness this groundswell of action and unify the districts against the Capitol. To help them achieve this, they need Katniss to serve as their standard bearer, their Mockingjay, but Katniss is more concerned with the fate of those victors who were not rescued and now find themselves prisoners of the Capitol; Johanna, Annie, and most importantly, Peeta, who the Capitol are using as their PR weapon. After failed attempts to film staged propaganda ads, the rebel leaders realise that it is Katniss’ authenticity which people most respond to, and as such she needs to get out in the field and experience firsthand the destruction the Capitol has wreaked. Mockingjay – Part I is a very different film to the first two in the series; The Hunger Games and its superior sequel Catching Fire. For starters, this time around there is no games to serve as the centrepiece for the film, and this really changes the dynamic of the movie. Mockingjay – Part I is a darker film, both thematically and visually. Director Francis Lawrence chooses to tell the story almost entirely from the point of view of the rebels. We are rarely privy to what is going on in the Capitol. That means that we as an audience are working off the same assumptions the rebel characters are. But as it was the scenes in the Capitol and arena which gave the first two films much of their visual flair, it means that Mockingjay – Part I lacks the colour and vibrancy of its prequels. Instead, we spend the majority of the film in the subterranean bunker of the rebellion, making for a less expansive, more claustrophobic film. Mockingjay – Part I is a war movie but not a combat film. Instead, its focus is on the behind the scenes mechanisms that are at play in war. The film explores the significant role of propaganda and messages, of symbols and songs, in unifying people in times of conflict. This is quite a topical area of exploration. As we watch the rebels and the Capitol engage in a back-and-forth through public addresses and viral video releases one can’t help but think about the parallels to the media wars between the West and Al-Qaida and now ISIS. 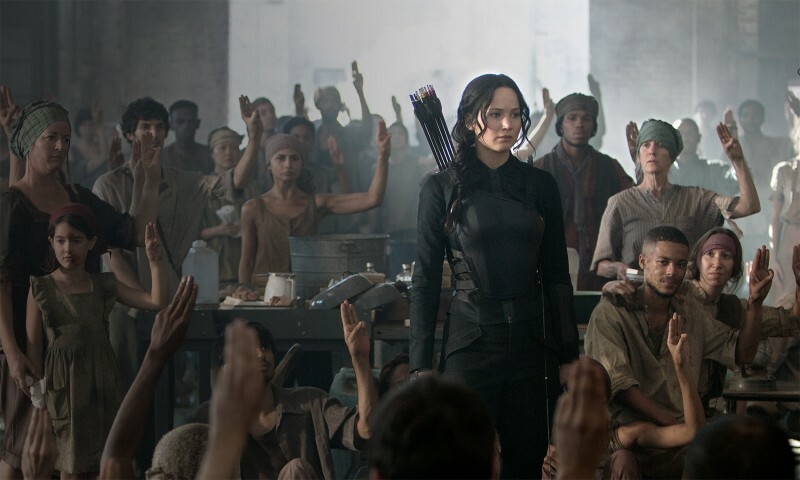 As their Mockingjay, their unifying symbol and standard bearer, Katniss is the revolution’s primary weapon. Peeta is the Capitol’s. His gaunt appearance leads us to assume that Peeta is being coerced and used by the Capitol to speak out against the rebellion. But is Katniss being just as used? From the start of the film we can see that she is tapped out, an emotional wreck after two rounds in the arena. But the rebellion needs her. How much, though, is this rebellion an extension of what Katniss represents and how much are the rebels simply co-opting her image and the people’s goodwill towards her to benefit their cause. The rebel leader President Coin is a cold and determined woman and we are only slightly more trusting of her than we are of President Snow. Our uncertainty of her is reinforced by her proclamations to the rebels, which are greeted with aggressive war chants in scenes that feel eerily reminiscent of Nazi rallies. It is the performances from the deep, high quality cast that elevates the film, as it has done for the entire series. This starts with Jennifer Lawrence, who again does most of the heavy lifting. By then end of this series Lawrence’s Katniss will undoubtedly stand alongside Sigourney Weaver’s Ellen Ripley and Linda Hamilton’s Sarah Connor as one of the cinema’s greatest action heroines. While Mockingjay – Part I is less physically demanding of Lawrence– she only fires one arrow in the whole film – it is still her character’s emotional journey we are on. The Katniss/Peeta/Gale love triangle is again prominent; a love triangle that is saved from cliché by the fact that it is entirely unromantic. Katniss’ interest in both guys is much more about emotional support than it is romance or passion. Most of the previous characters return for this instalment – some with bigger roles, others with smaller roles – and it is the presence in these supporting roles of veteran, high quality actors like Donald Sutherland, Julianne Moore, Jeffrey Wright, Stanley Tucci and Philip Seymour Hoffman (to whom the film is dedicated) that fleshes out this world and gives it weight. The themes of rebellion against the machine that are central to Mockingjay – Part I feel slightly insincere when presented in such a formulaic major Hollywood blockbuster. The film lacks the rebellious spirit of its narrative. There is nothing the slightest bit subversive about the film, as evidenced by the cynical, money-grabbing decision to split Collins’ final novel into two instalments. Mockingjay – Part I suffers from all of the problems that are to be expected of a ‘Part I’ movie, a film which only tells the first half of a story. The film is light on narrative events and action. The games are gone and have not been replaced with an equivalently satisfying action source. The film is much more about character development than narrative action, and while it does succeed in building up some tension it obviously lacks any sort of resolution. You leave this film feeling like you’ve only watched the first half of a movie, though you’ve paid for a whole one. Katniss continues to be a strong heroine, Collins narrative is as engaging as it has always been, and Mockingjay – Part I performs its function within the overall Hunger Games franchise by setting up the final film quite well. However, what seems to often get lost in Hollywood studio thinking when dealing with their money-spinning franchises is that each piece should, first and foremost, function effectively as a film in its own right. Mockingjay – Part I feels like the first half of a pretty good film. Ultimately, it will fall to Mockingjay – Part II to show that there was creative and not just economic justification for the decision to break the final instalment into two films rather than a single two-and-a-half to three hour movie. 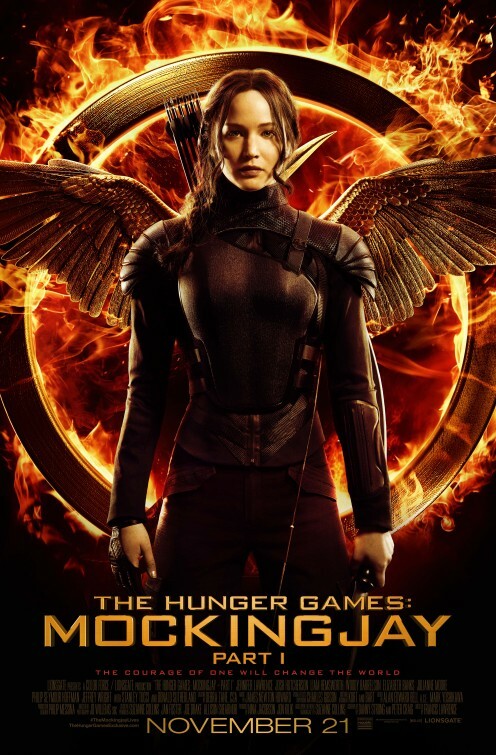 Have you seen The Hunger Games: Mockingjay – Part I? Leave a comment and let us know what you thought.